Follow along as we share stories from our female staff, junior collaborators, and alumni about why they love being girls who make things with their own two hands. Presented with a small stack of lumber, a few hours to build, and the idea of playing pool with bowling balls, today's kids’ creativity and ingenuity took us from a pile of 18 sticks of 2x4 to a fully functioning (and delightfully fun!) game of billiards that featured a pool cue, a bridge, four "pockets" and bumpers. Not a bad view to wake up to every morning, now is it? We're ready to get off and running for day two, as we've got a lot ground to cover. Today will serve as Tool Training 101 for all our first time Project Ember campers, with some more advanced challenges for our veterans who've gone through ample trainings in their time. ...but it's nothing a case of the tiny hands can't fix. Christopher lays out the basics of drill use. First up for our first-time campers is Drills 101. Along with the miter saw and the lumber itself, there are few things more essential to our build site than the drills. Though the basic principle is familiar to most, we dive into the various hazards and how to prevent injury and errors as well as some tips for frustration-free use. For example, if you don't secure the wood, it can suddenly spin and hurt you or your teammate. We also emphasize the importance of picking the right screw for the job so that we never have weak joints from screws that were too short or sharp pointy bits ("Mr. Dangerous") from screws that were too long. This is especially important in an environment where so many people are interacting with a project simultaneously. Christopher also demonstrated how important it is to tie back your hair and clothes when using a drill. Phoenix uses the weight of his body to drive the screw. Sonia and Marvon secure their boards with a steady knee. Meanwhile, the alumni each demonstrate proper use of the miter saw as a review before moving into their own drill training, though this time the roles are reversed. We've challenged them to plan their own mini-lesson and teach the collaborators how it's done. To scaffold their lessons, we let them know how we think about teaching a tool at Project Ember. What are the objective and subjective hazards of the tool and its operator? Provide a strategy for minimizing each hazard. Hannah, Reid, Addison and Zeke brainstorm the important components of a drill lesson. Alex explains why Victory Drilling (pumping the trigger when not drilling) is dangerous and to be avoided. 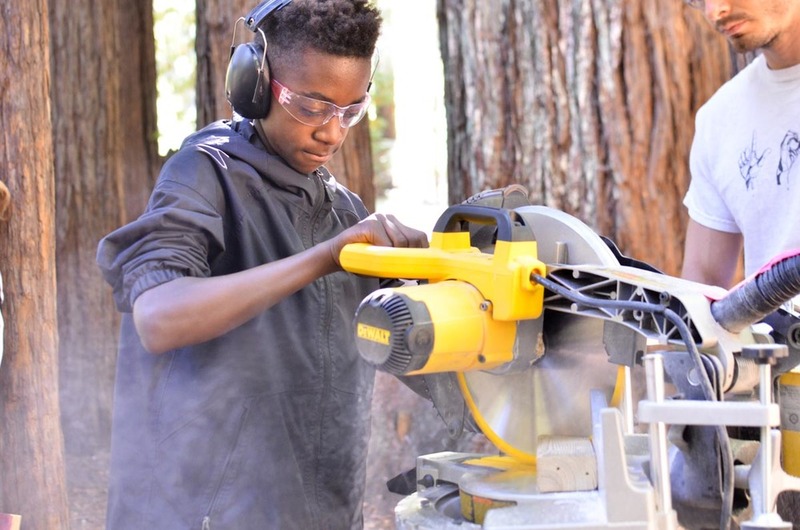 Next up for Jonah, Marvon, Sonia and Phoenix is Miter Saw 101. 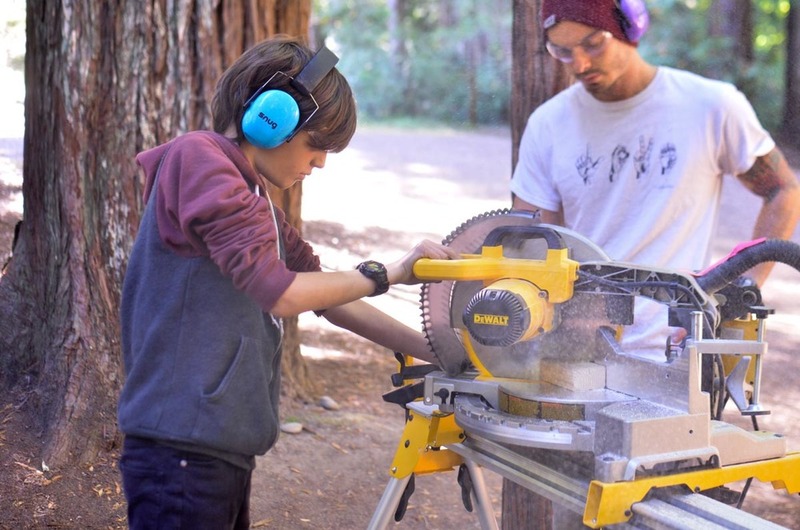 The miter saw is among the most powerful tools in regular use at Project Ember, but with a solid understanding of the hazards involved, it is also an incredibly safe tool. Christopher emphasizes the ready call - the way we begin anything with significant risk at camp. All campers within range verify with a thumbs up that not only are they ready with their safety gear on, but that they approve of the way the operator has set up the cut. They all use the tool methodically and skillfully. Hannah, Zeke, Reid and Addison play with placement for their tic-tac-toe jig. Next up for the alumni is a lesson on jigs. If we're working on a project that requires us to do the same thing over and over, a jig allows us to do so with accuracy and speed. Most jigs are custom and therefore take both time to plan and build, which can pay off big time depending on the project. Today our challenge is to come up with a jig that would allow us to produce 100 identical tic-tac-toe boards made out of 2x3. Jigs can take many forms, and our two alumni groups come up with different strategies. Often times, a solution can be putting blocks into the negative space of the design so that the pieces needing to be assembled fit around it like puzzle pieces. Meanwhile, Josh covers a number of important building principles with Marvon, Jonah, Sonia and Phoenix through a mini-build project. They make a triangular gusset, with help from a builder's best friend - the clamp. If there's one thing to know about building robust structures, the triangle is probably it. That almost feels like a full day's worth of work, but that was just the first hour of the day! On Mondays, we start with a mini-project to get a little more building under our belts before diving into the week's main project. A oldie, but a goodie, we announce the mini-project - benches to sit around the fire pit for the rest of the week. Jonah has built many a bench before, as have a few of the other experienced makers, but that provides us with a good opportunity to talk about the importance of revisiting challenges so that we can incorporate what we've learned and do it even better. Plus, we still need a place to sit! Bench groups are the same as small groups, and we quickly have three designs in motion. Addison, Sophia, Zeke and Phoenix have come up with a woven design, hoping to have an extra comfy seat. Anna, Reid, Sonia and Jonah also have relaxing in mind, and design a relatively standard bench, but add the flare of gentle rockers. Jonah's also got a great idea for a foldable tea table on the side. Our last group is thinking ambitiously with many variables. The initial drawing includes a rocking swing like bench with a reclining back that can be completely flattened into a hanging futon. What more perfect way to end the night than on a star-gazing bed you built yourself? Alex, Marvon, Hannah and Liam assess if the lofty design will be possible in just one afternoon and get right to work. Looks like the rocker is definitely going to need a backrest. The rest of the crew comes over to check out how the rocking benches feel. Meanwhile, Christopher's team is plenty busy stringing their paracord back and forth and pulling it taught as can be so that it doesn't sag too much over time. Below Phoenix ties off the last of the bottom rows. With only a few hours total to design and build our benches, we've ended up with very successful and unique designs and a comfortable place to enjoy the fire. Small groups meet up to discuss the differences between intent and impact and the importance of clear communication within a team. Everyone can empathize with a time when their intent was misunderstood. Try as we may, language is an imperfect medium. The evening closes with a few more Spotlights, though Zeke and Phoenix have both headed to bed early tonight so Anna, Addison, and Reid volunteer. Anna shares about her experiences working in a homeless shelter and how she gained perspective on life through a series of interactions. Addison recalled a time he was mystified by finding a white polo shirt in the toilet and the hilarity that ensued. Reid closed out the night with the story of Project Mitten - an ambitious project took on by our friends at Tinkering School where the kids set out to build a boat and sail it on Lake Michigan. Tomorrow is the big reveal of the project for this week. Be sure to check back soon! After months of anticipation, we have finally arrived at our week of overnight camp, wrapped in the beauty of the Redwoods of the California Coast. All of our host sites have added something special to the flavor and the project possibilities of our camps, and Westminster Woods does not disappoint! There's nothing quite like the sense of calm and wonder motivated by a sky-reaching grove of nature's giants.